Remote profiling is the case when the profiled application and the profiler UI run on different machines, usually on a server and your developer machine correspondingly. See also Profile local applications. Special notes on profiling a Windows service can be found here. Start the application you want to profile. It should start with the profiler agent. 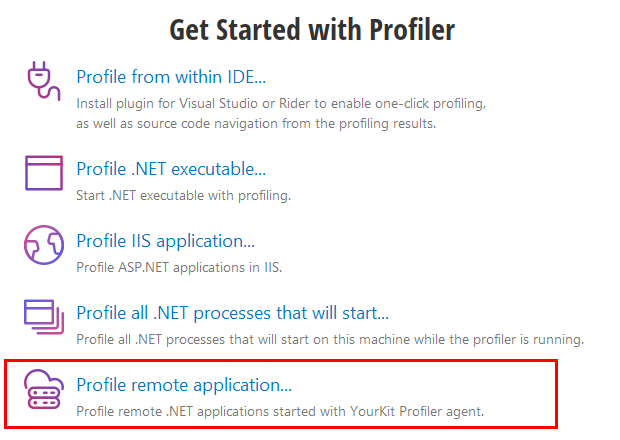 To profile .NET applications running on the remote machine with agent use Profile remote application... action on Welcome screen or in "Profile" menu. 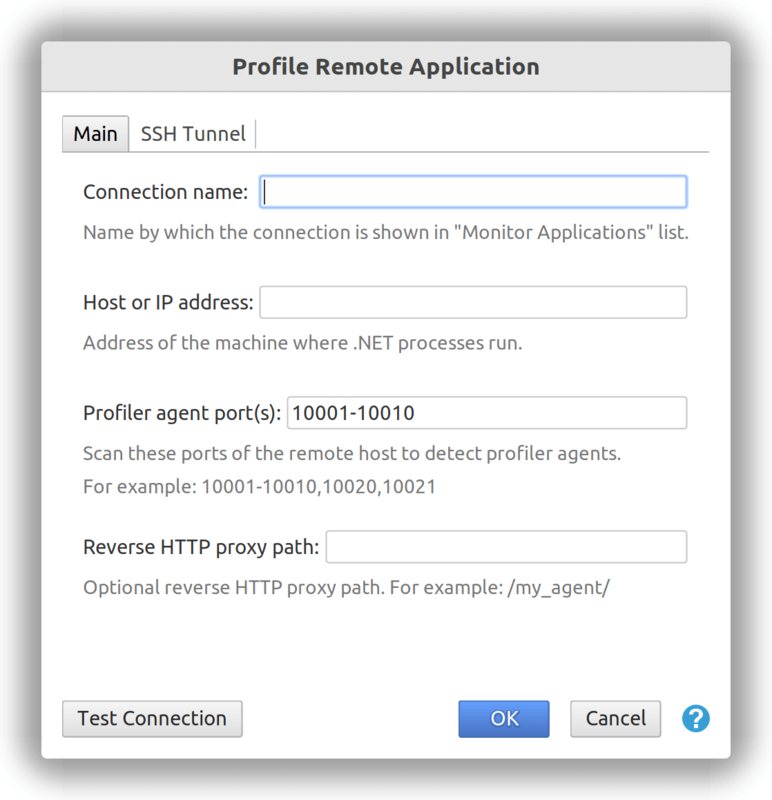 Specify the host name or IP address of the remote machine in the opened "Profile Remote Application" dialog. Profiler discovers applications running with the profiler agent. Ports in the given range will be scanned. By default the profiler agent port is allocated in the range 10001-10010. If the profiler port was changed with startup option 'port', also change the Profiler agent port(s) field accordingly. 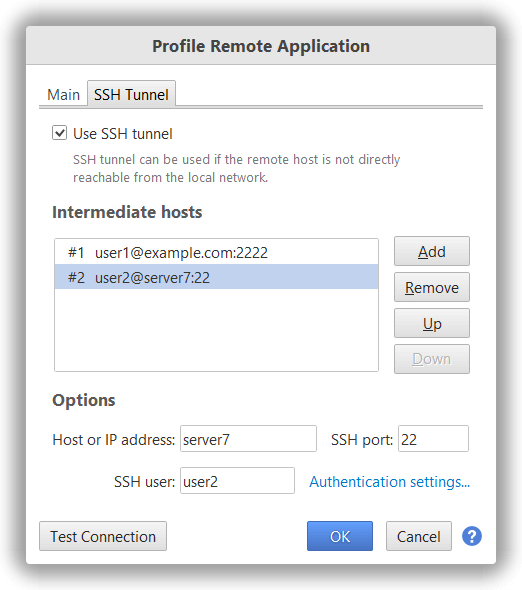 If the remote host is not directly reachable you can build SSH tunnel. To do so, navigate to the SSH Tunnel tab and enable SSH tunnel using Use SSH tunnel checkbox. Created connection will appear in the "Monitor Applications" list on Welcome screen under a given name. You can then connect to the application to perform profiling. If you do not see your application it the list, please read Remote profiling troubleshooting. Please note that for SSH connections known hosts are not checked, and StrictHostKeyChecking SSH parameter is set to no.